102 Beacon is located on the north side of Beacon, between Arlington and Berkeley, with 100 Beacon to the east and 104 Beacon to the west. 102 Beacon was built ca. 1856, one of a symmetrical pair (100-102 Beacon) with a shared portico and front stairs and a mansard roof (among the earliest in the Back Bay). It was originally numbered 101 Beacon, but re-numbered as 102 Beacon ca. 1862 when homes were built on the south side of the street. 102 Beacon was built for Charles Bucknam Fessenden and his wife, Susan Elizabeth (Skinner) Fessenden. Charles Fessenden was a shipping merchant and ship owner in the East India trade. They lived at 6 Beacon and then at 22 Beacon; it does not appear that they ever occupied 102 Beacon. 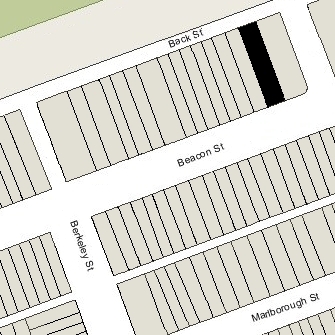 Charles Fessenden purchased the land for 102 Beacon January 1, 1855, from the Boston and Roxbury Mill Corporation. The lot originally had a frontage of 30 feet. On the same day, George O. Hovey acquired the lot to the east, at the corner of Beacon and Otter Street (later Embankment Road and then David G. Mugar Way). Otter Street had not yet been built, and in May of 1855 the Boston and Roxbury Mill Corporation sold a lot with a 10 foot frontage to the east of where the street was planned to go so that William Walter Goddard could construct a stable behind his house at 99 Beacon. To accommodate Otter Street, on May 24, 1855, George Hovey sold the eastern ten feet of his lot back to the Boston and Roxbury Mill Corporation, Charles Fessenden sold the eastern ten feet of his lot to George Hovey, and the corporation sold Charles Fessenden a lot with a thirteen foot frontage to the west of his lot, increasing his lot from thirty to thirty-three feet. Click here for an index to the deeds for 102 Beacon. On December 1, 1856, after the houses were built, Charles Fessenden and George Hovey entered into an agreement to clarify their rights with respect to the shared portico, coal bin located under the front steps, cesspool, and drainage. On March 20, 1857, 102 Beacon was purchased from Charles H. Mills, William Perkins, and Jacob C. Rogers, assignees of Charles Fessenden, by Henry Parkman Sturgis. He and his wife, Elizabeth Orne (Paine) Sturgis, made it their home. George R. R. Sturgis, Henry Sturgis’s son by his first marriage (to Mary Howard), lived with them until his death in 1865. Henry Parkman Sturgis was a merchant in the China trade, in partnership with his brother, Russell Sturgis. He lived in Macao and later in Manila (where he was US Consul), and then returned to Boston, where he was a merchant in his own firm. 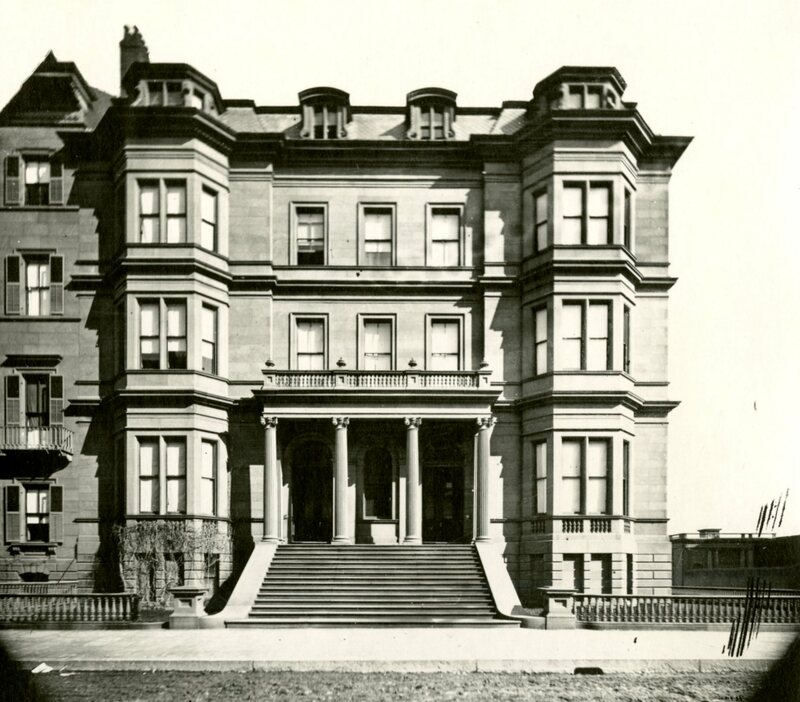 Henry and Elizabeth Sturgis continued to live at 102 Beacon until about 1868. He died in December of 1869 in London. On June 23, 1868, 102 Beacon was acquired from Henry Sturgis by shoe manufacturer Joseph Whitney and his wife, Elizabeth (Pratt) Whitney. Joseph Whitney died in September of 1869, and on October 11, 1869, she elected to have 102 Beacon owned by their son, Henry Austin Whitney, as trustee under Joseph Whitney’s will. She continued to live at 102 Beacon until her death in January of 1890. On March 1, 1890, 102 Beacon was acquired from Ellerton Pratt Whitney, successor trustee under the will of Joseph Whitney, by Miss Marian Hovey (Henry Austin Whitney died in February of 1889 and Ellerton Pratt Whitney was his son). Marian Hovey lived at 100 Beacon. Joseph Oliver was a physician and Harvard Medical School lecturer on children’s diseases. He also maintained his medical office at 102 Beacon. Dr. Oliver was separated from his wife, Grace Atkinson (Little) Ellis Oliver, who lived with her father, James Lovell Little, at 2 Commonwealth and then in Salem. She was an author and biographer, and at the time of her death in May of 1899, served as a member of the Salem School Committee. By 1894, Dr. William Lothrop Edwards, also a physician, had joined Dr. Oliver at 102 Beacon. Dr. Edwards married in June of 1897 to Alice Loring. 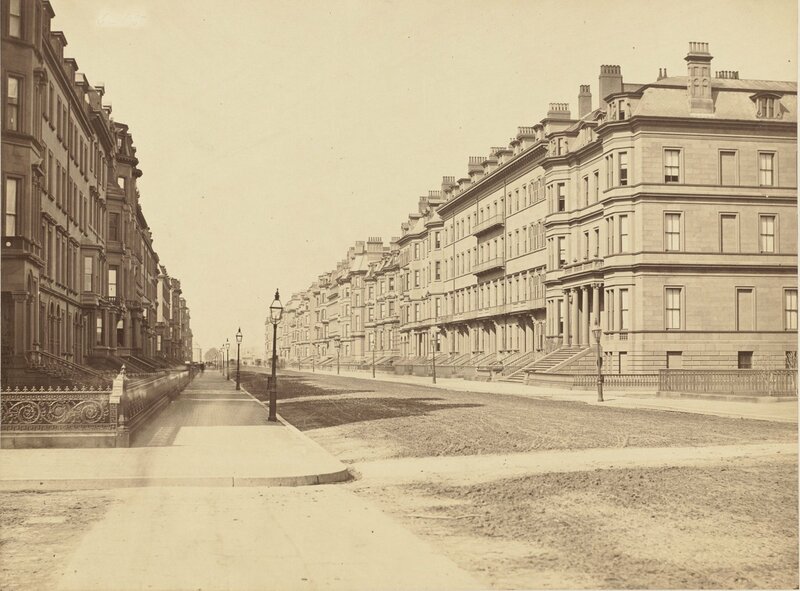 After their marriage, they lived in an apartment at The Grosvenor at 259 Beacon, and he continued to maintain his office at 102 Beacon with Dr. Oliver. In about 1900, William and Alice Edwards moved to 102 Beacon to live with Dr. Oliver. Joseph Oliver died in September of 1903 while traveling in Paris with William and Alice Edwards. The Edwardses moved thereafter to 125 Beacon. 102 Beacon was not listed in the 1904 Boston Blue Book. During the 1904-1905 winter season, it was the home of retired cotton manufacturer Moses Brown Lockwood Bradford and his wife, Florence (Hoar) Bradford. They previously had lived at 441 Beacon. They also maintained a home in Concord. By the next season, they had moved to 80 Bay State Road. 102 Beacon was not listed in the 1906 Boston Blue Book. On January 17, 1906, 102 Beacon was acquired from the estate of Joseph Oliver by Samuel Eliot Guild. He and his wife, Jessie Rodman (Motley) Guild, made it their home. They previously had lived at 161 Beacon. They also maintained a home in Nahant. On February 17, 1922, Samuel Guild transferred the property into his wife’s name. Samuel Guild died in February of 1925. Jessie Guild continued to live at 102 Beacon with their three sons: Samuel Eliot Guild, Edward Motley Guild, and Henry Rice Guild. 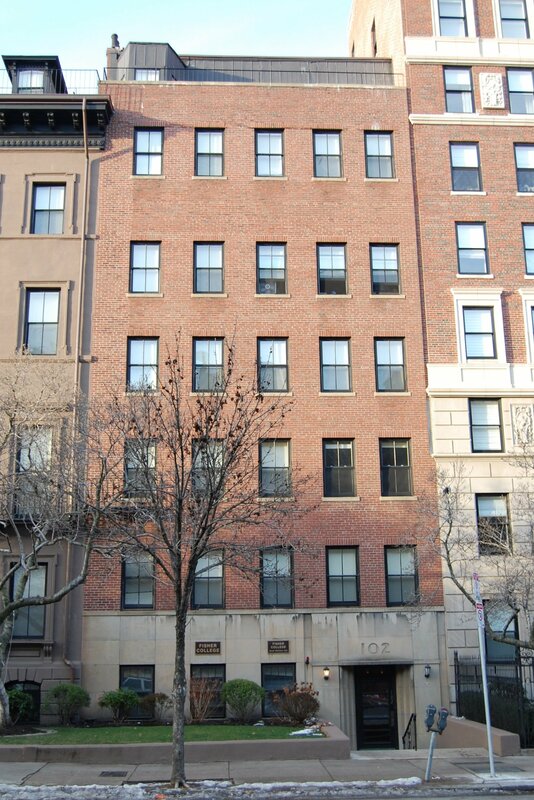 Samuel Eliot Guild, an investment counselor, married in February of 1926 to Jane Peters; after their marriage, they lived in an apartment at 282 Beacon. Henry Rice Guild, a lawyer, married in October of 1927 to Martha Pintard Bayard; after their marriage, they lived in Brookline. Edward Motley Guild, an accountant, married in September of 1928 to Mrs. Corina Codman (Ely) Nichols, the former wife of Hall Nichols; after their marriage, they lived in Brookline. Jessie Guild continued to live at 102 Beacon until about 1937, when she moved to an apartment at 282 Beacon. On July 1, 1937, 102 Beacon was acquired from Jessie Guild by Katherine Kelly. She was a secretary in the Brookline offices of real estate dealer William Walter Taff, Jr., He and his widowed mother, Agnes Celia (O’Riorden) Taff, owned and lived at 100 Beacon. In February of 1938, Katherine Kelly applied for (and subsequently received) permission to significantly remodel 102 Beacon, changing it from a single-family dwelling into an apartment house with 18 units. The remodeling – designed by Herman L. Feer — included a new front façade, new stairs, and an exterior addition and “piazza” at the rear. Plans for the remodeling — including a front elevation, floor plans, framing plans, and a foundation plan — are included in the City of Boston Blueprints Collection in the Boston Public Library’s Arts Department (reference BIN R-7). On May 21, 1938, the remodeled building was acquired from Katherine Kelly by 102 Beacon Street, Inc., of which William Taff was president. Among the residents at 102 Beacon was Mary (Curley) Donnelly, the daughter of former Governor and Mayor Curley and the former wife of Edward Calvin Donnelly, Jr., chief executive of John Donnelly & Sons, outdoor advertisers. She died at 102 Beacon on February 11, 1950, and her brother, Leo, died there the next day. On June 6, 1962, 102 and 104 Beacon were acquired from 102 Beacon Street, Inc., by Fisher College. On the same day, Fisher College also acquired 106 Beacon from Edward Mitton. In December of 1964, Fisher College applied for (and subsequently received) permission to convert the building from an 18 unit apartment house into a dormitory.